Bengaluru, July 05 2018: In a big relief to the farm sector, Karnataka Chief Minister H D Kumaraswamy today announced a mega Rs 34,000 crore farm loan waiver scheme in the maiden budget of the Congress-JDS coalition government. 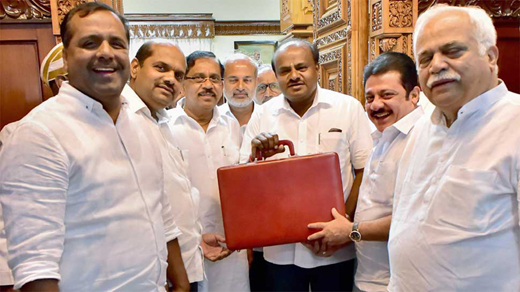 Unveiling the budget proposals in the Assembly, Kumaraswamy, who also holds the finance portfolio, said he has limited the loan amount to Rs 2 lakh, as it was "not right" to waiver higher value crop loan. "Due to this crop loan waiver scheme, farmers will get the benefit of Rs 34,000 crore," Kumaraswamy said, seeking to fulfil a major electoral promise made by the JDS in its manifesto for the recently held assembly polls in the state. With the waiver scheme imposing a huge burden on the exchequer, he also announced proposals to mop up additional resources, including increase in the rate of tax on petrol by Rs 1.14 per litre and diesel by Rs 1.12 per litre. He also proposed a hike in the additional excise duty on Indian-made liquor by 4 per cent across the board on all 18 slabs. Kumaraswamy recalled his assurance to waive all types of crop loans of farmers taken for agricultural activities within 24 hours of formation of a full-fledged government. "However, even though the people of the state have not blessed a single party government, I have been provided with a good opportunity to form a coalition government and to work as chief minister of that coalition," he said. Kumaraswamy said he had decided to waive all defaulted crop loans of the farmers made up to December 31, 2017 in the first stage. Besides this, it has been decided to credit the repaid loan amount or Rs 25,000, whichever is less, to each of the farmers account, to help farmers who had repaid the loan within time, the chief minister said. The families of the government officials and officials of the cooperative sector, farmers who have paid income-tax for the past three years and other ineligible farm loan recipients will be outside the purview of the loan waiver scheme.